I had high hopes for this book and was slightly disappointed. Although it is well written, I found the style at times irritating. The storyline is interesting enough and the characters are realistic, but I simply was not hanging on every word or desperately reading late into the night. The book revolves around the Judds, a seemingly ordinary family of five. Charles and Daphne have retired to an idyllic Cornish town to live out the rest of their lives walking along the beach, playing golf, arranging flowers and experimenting with fish recipes. However, life for this particular family has been uncertain and on edge since the prodigal daughter, Juilet, or Ju-Ju, was arrested two years earlier. She was then sentenced to prison for art theft which turned their lives upside down. Now, on the day of her release, Ju-Ju’s family are preparing and desperately hoping that the world will now right itself and life will gradually go back to normal. Cartwright skilfully portrays each family member so that they are all very believable characters. Charles, slightly past middle age, is a grumpy, absent minded husband and father. Since his favourite child has been in prison, he has felt lost and most of the family think he is ‘cracking up’. His thoughts are brilliantly conveyed and Cartwright is brutally honest about the amusingly inappropriate thoughts that pop into his mind. Daphne, trying eagerly to pretend everything is OK, goes from one disaster to another in the kitchen, while attempting to cook Rick Stein recipes. Her perseverance, although cringingly over the top, is very endearing. Her relationship with her younger daughter Sophie is particularly interesting, heart warming and a theme which could have been further explored. While the Judd family struggles on in England, the story also follows Ju-Ju and her younger brother Charlie on their journey home from the prison in New York. The insights into Charlie’s love life and Ju-Ju’s past were to be expected, but I didn’t find that these chapters much interested me. I found the relationships between the family back in England were far more representative of true human nature. Throughout the book, there are constant references to ‘Englishness’ and what it is to be English. Being set between a typically Cornish town with its bustling local church, and London, with the cockney market workers, this is a perfect book to explore the changing language in a modern England. Also, the English idea of ‘keeping a stiff upper lip’ and not talking about your problems is very relevant in the plot. 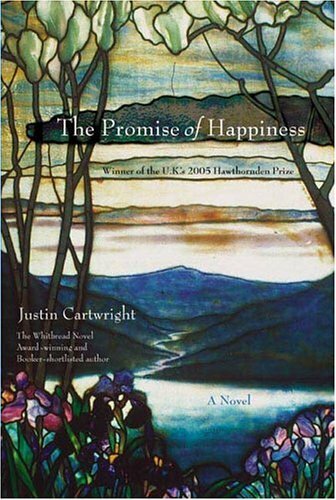 I found many aspects of The Promise of Happiness very enjoyable and witty, however it lacked a certain something to make it a page turner. Click on the picture below to buy the book! I’m torn. I’m heading to England soon for a trip so it might be useful to read to learn a little about customs. But you said it isn’t a page turner. Would you suggest it for learning about England before a trip? I would actually really recommend the book just to get a ‘feel’ for England and ‘Englishness’. It is worth reading, but I felt as though there was something missing from it. My dad loved it, so maybe it just appeals more to certain people. Enjoy your trip to England! Where are you going? I requested the book from the library. I’ll let you know if I can get into it. I’ll be in London.